Nifty opened strong and went up to the highs at 6730, but profit booking from higher levels saw the index below the psychological level of 6700. The responsive buyer came back towards the end to close the index in positive at 6704.20, a small gain of 8.30 points. The broader market was strong, with 1036 advances to 439 declines. Best support right now at 6500-6600. 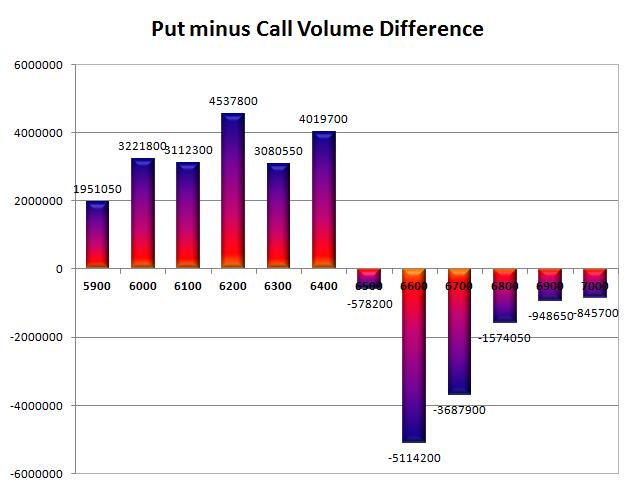 Call option 6700-6900, 7100 added 8.73 lacs huge amount of OI with small short covering seen at 6500 and lower strike prices. Put option 7000-6400 added 25.87 lacs huge amount of OI with small profit booking seen at 6200 and lower strike prices. 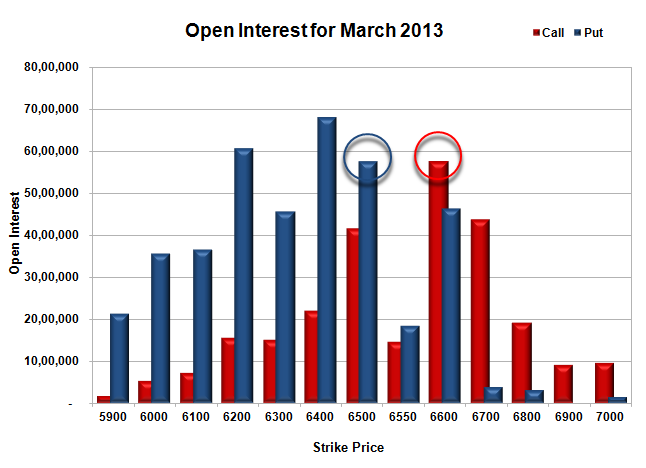 Nifty Open Interest is at 1,70,19,650 up by 1,02,750, with small increase in price, most probably long build-up. 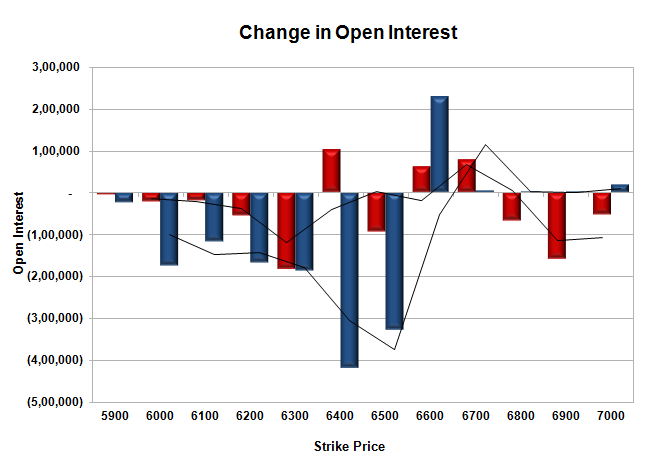 Bank Nifty Open Interest is at 15,92,975 up by 5,825, with small decrease in price, most probably small short build-up. FII’s sold huge 2.67 lacs Futures, mostly short build-up, as their net OI increased by 16918 contracts (includes 45064 longs to 50400 shorts for the day) and the average price per contract comes to around 6701.22. FII’s future open contract as on date is 387783. PCR Open Interest (Volume) is inching up and now at 1.171. 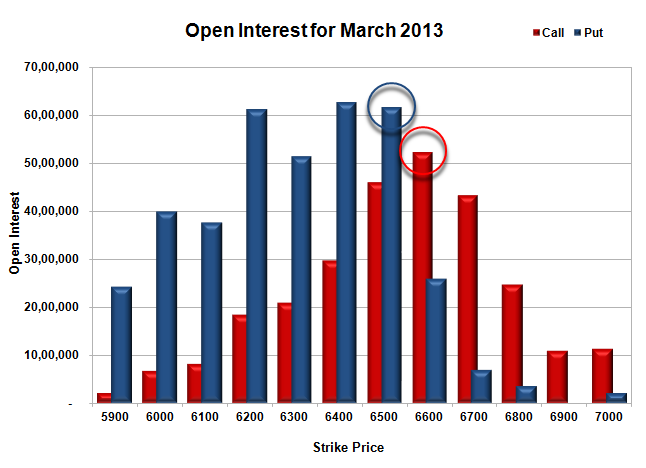 Initial support at 6600, with huge OI of 36.62 lacs and below that at 6500 with highest OI of 36.88 lacs. 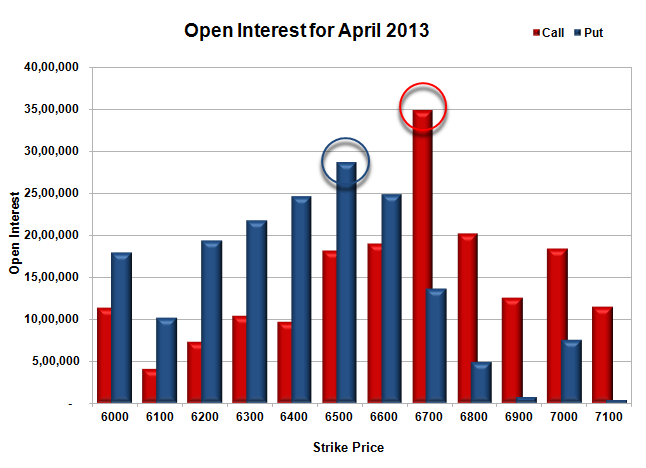 Initial and best resistance still at 6700, with huge OI of 36.72 lacs and above that at 6800 with OI of 25.42 lacs. Day Range as per Option Table is 6662 - 6730 and as per VIX is 6628 - 6780 with 6699 as the Pivot. Nifty opened positive and stayed in a narrow range with positive bias for the better part of the day with huge buying seen in the last hour to move the index above 6700 but closed just below at 6695.90, huge gain of 54.15 points. On a week-on-week basis the index gained 201.00 points or approx 3.09%. The broader market was also strong, with 1027 advances to 467 declines. Best support at start of the series is 6500. Call option 6800-7100 added 23.55 lacs huge amount of OI with small short covering seen at 6600 and lower strike prices. 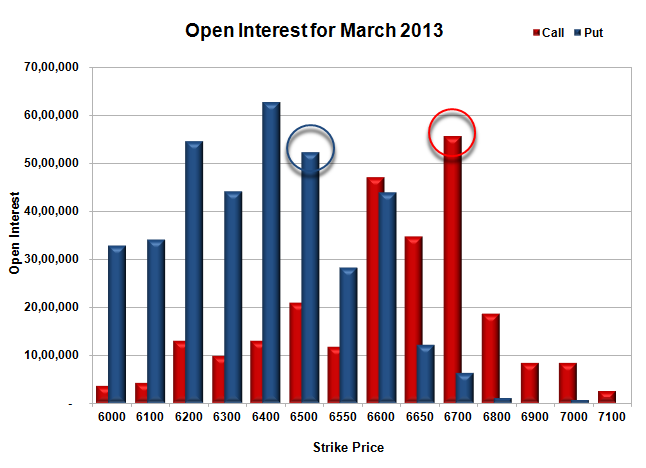 Put option 6700-6000 added 34.08 lacs huge amount of OI with more addition seen at 6800 and higher strike prices. 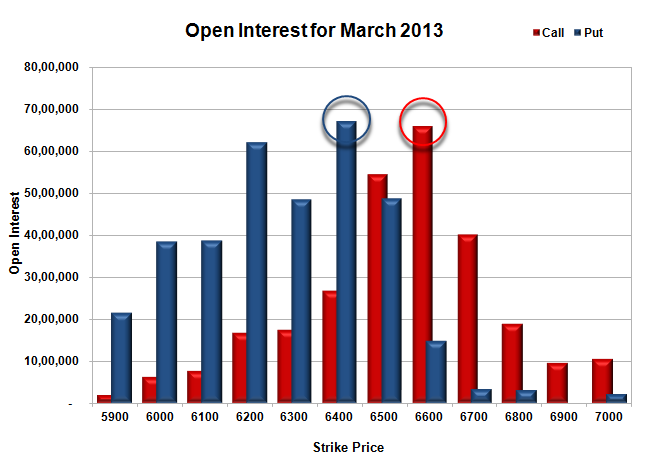 Nifty Open Interest is at 1,69,16,900 up by 8,28,150, with increase in price, most probably huge long build-up. 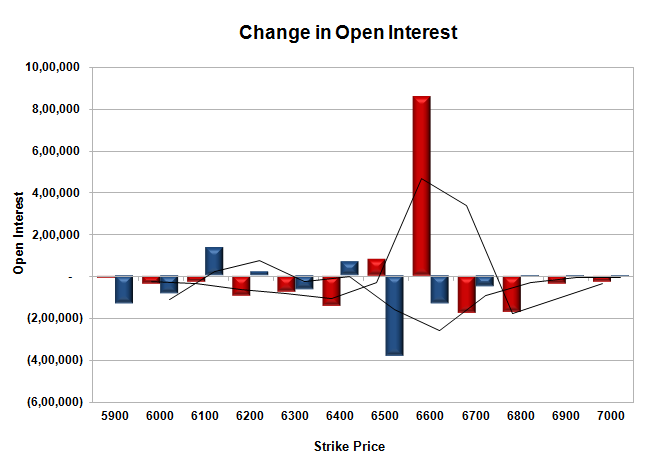 Bank Nifty Open Interest is at 15,87,150 up by 21,125, with increase in price, most probably long build-up. FII’s bought huge 4.53 lacs Futures, mostly long build-up, as their net OI increased by 24953 contracts (includes 46693 longs to 37638 shorts for the day) and the average price per contract comes to around 6689.69. FII’s future open contract as on date is 370865. PCR Open Interest (Volume) has just inched up to 1.062. Initial support getting stronger at 6600, with huge addition for the day at 7.12 lacs and below that at 6500 with highest OI of 33.31 lacs. 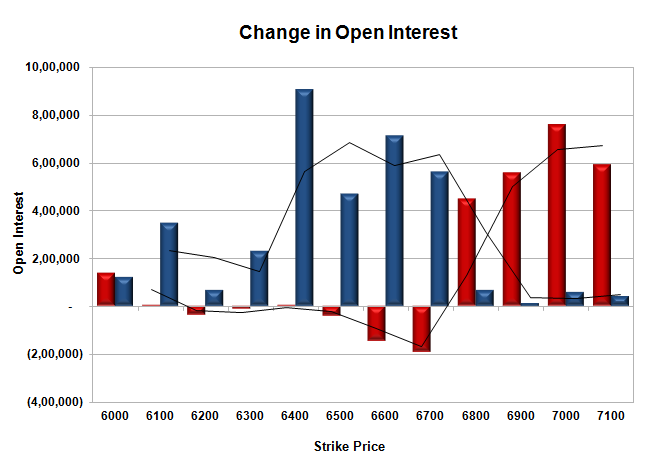 Initial and best resistance still at 6700, with huge OI of 32.97 lacs and above that at 6800 with huge OI of 24.64 lacs. 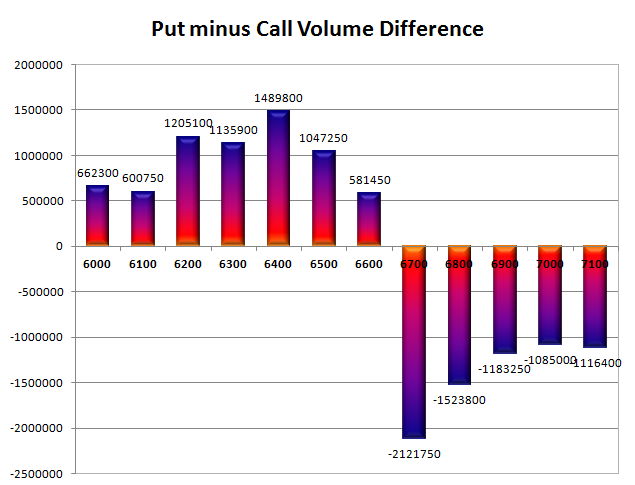 Day Range as per Option Table is 6640 - 6730 and as per VIX is 6631 - 6761 with 6681 as the Pivot. Nifty opened strong above the psychological level of 6600 and went up to touch the highs of day at 6627. A small sell-off towards the second half saw the index below 6600 level but closed just above at 6601.40, small gain of 11.65 points. The broader market though was weak, with 674 advances to 801 declines. Best support for the series at 6400 and resistance at 6700. 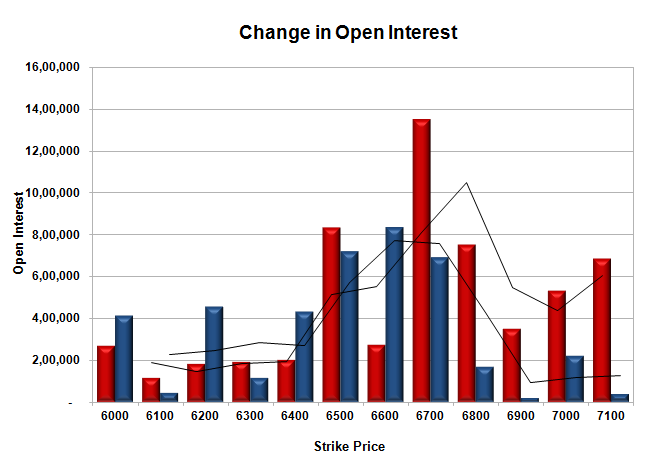 Call option 6650-6700 added 7.52 lacs huge amount of OI with huge short covering seen at 6600 and lower strike prices. Put option 6700-6650, 6550 added 15.01 lacs huge amount of OI with profit booking seen at 6500 and lower strike prices. Nifty Open Interest is at 1,54,22,600 down by 32,95,050, whereas April Series also added 23.72 lacs with small increase in price, mostly rollover with huge long liquidation/short covering. Bank Nifty Open Interest is at 12,62,175 down by 1,52,200, whereas April Series added 3.89 lacs with increase in price, most probably 100% rollover with huge long build-up. FII’s bought huge 13.15 lacs Futures, mostly short covering, as their net OI decreased by 25614 contracts (includes 198028 longs to 171736 shorts for the day) and the average price per contract comes to around 6596.80. FII’s future open contract as on date is 658508. PCR Open Interest (Volume) is at the highest point at 1.650. Initial support at 6550, with huge addition for the day at 3.23 lacs and below that at 6500 with huge OI of 52.31 lacs. Initial resistance at 6650, with OI of 34.68 lacs and above that at 6700 with huge OI of 55.57 lacs. 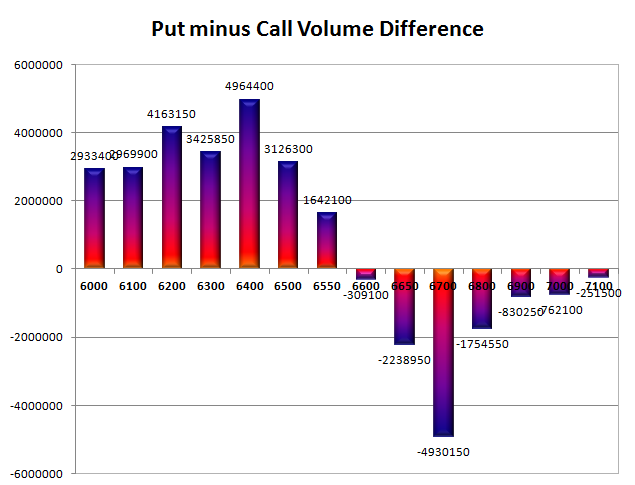 Expiry Day Range as per Option Table is 6558 - 6645 and as per VIX is 6540 - 6663 with 6603 as the Pivot. Nifty opened weak around 6550 level but saw the buyer back and the index above the previous days close. The index oscillated around the dotted line in a narrow range and closed just above at 6583.50, small gain of 6.25 points. The broader market though was weak, with 661 advances to 820 declines. Best support for the series at 6400 and resistance at 6600. 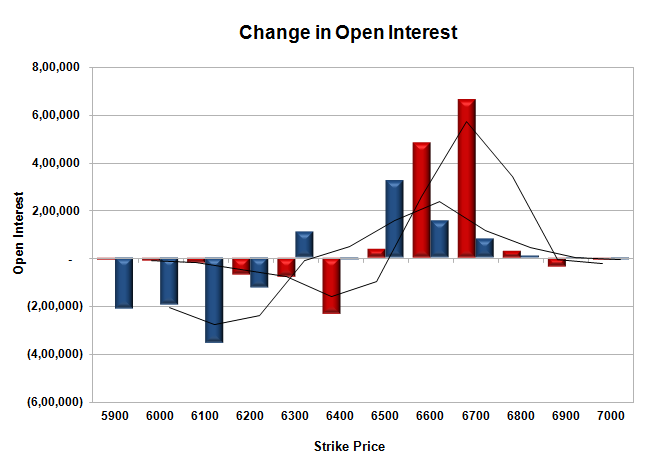 Call option 6550-6800 added 17.42 lacs huge amount of OI with huge short covering seen at 6500 and lower strike prices. Put option 6600-6500 added 10.61 lacs huge amount of OI with profit booking seen at 6400 and lower strike prices. Nifty Open Interest is at 1,87,17,650 down by 18,23,150, whereas April Series also added 31.22 lacs with increase in price, most probably 100% rollover with huge long build in new series. Bank Nifty Open Interest is at 14,14,375 down by 2,49,000, whereas April Series added 2.57 lacs with increase in price, most probably 100% rollover with small long build-up. FII’s bought huge 5.15 lacs Futures, mostly long build-up, as their net OI increased by 51478 contracts (includes 166727 longs to 156431 shorts for the day) and the average price per contract comes to around 6589.81. FII’s future open contract as on date is 684122. PCR Open Interest (Volume) is at 1.446. Initial support at 6550, with huge addition for the day at 6.58 lacs and below that at 6500 with huge OI of 60.17 lacs. 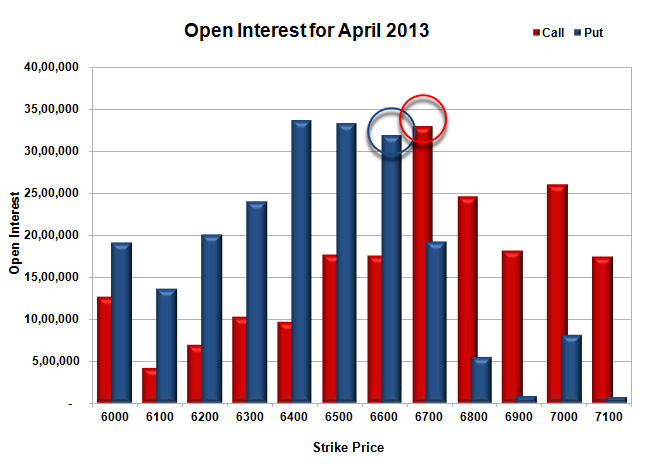 Initial and best resistance still at 6600, with OI of 61.17 lacs. 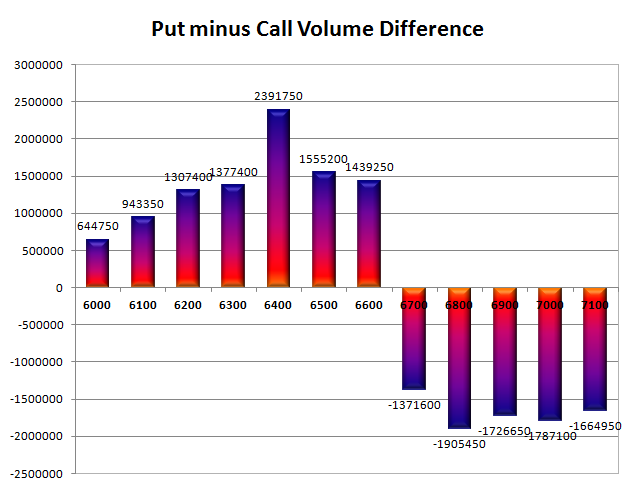 Day Range as per Option Table is 6533 - 6623 and as per VIX is 6531 - 6648 with 6577 as the Pivot. Nifty opened just above 6500 level but saw huge buying interest from the word go to top all time high and closed just shy of 6600 level at 6583.50, huge gain of 88.60 points. The broader market though was weak, with 708 advances to 766 declines. Best support for the series at 6400 and resistance at 6600. 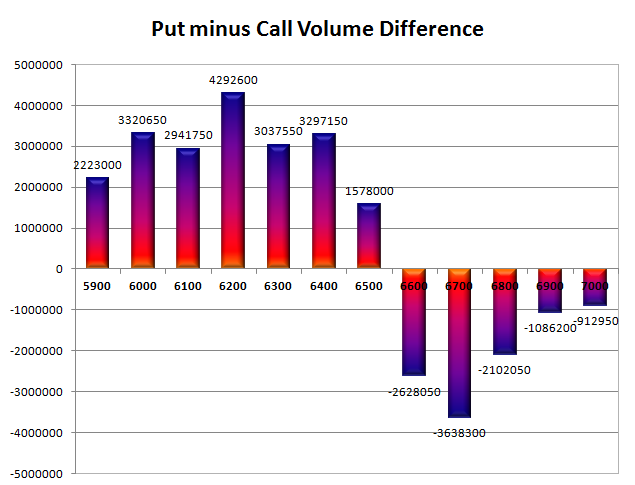 Call option 6700-6800 added 4.81 lacs huge amount of OI with huge short covering seen at 6600 and lower strike prices. Put option 6700-6400 added 54.73 lacs huge amount of OI with profit booking seen at 6300 and lower strike prices. Nifty Open Interest is at 2,05,40,800 up by 4,96,950, whereas April Series also added 22.97 lacs with increase in price, most probably huge long build in both series. Bank Nifty Open Interest is at 16,63,375 down by 25,025, whereas April Series added just 1.84 lacs with increase in price, most probably 100% rollover with huge long build-up. FII’s bought huge 15.96 lacs Futures, mostly long build-up, as their net OI increased by 76867 contracts (includes 143383 longs to 111462 shorts for the day) and the average price per contract comes to around 6576.18. FII’s future open contract as on date is 632644. 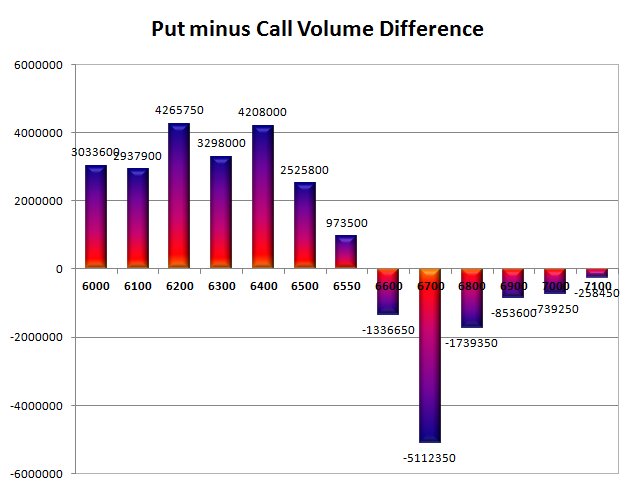 PCR Open Interest (Volume) is at the highest point of the series at 1.459. Initial support at 6550, with huge addition for the day at 11.80 lacs and below that at 6500 with huge OI of 57.65 lacs. 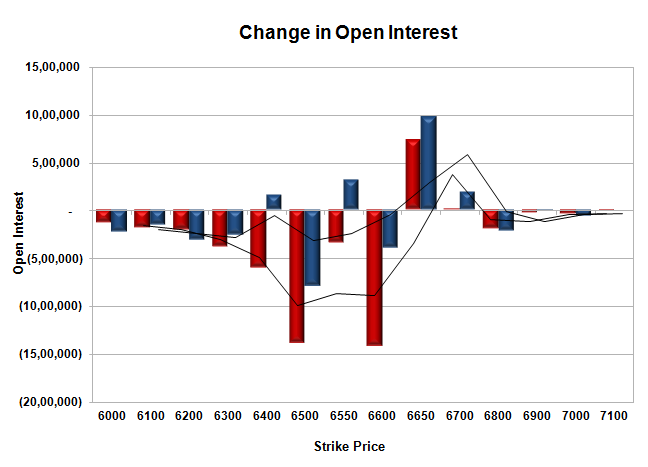 Initial and best resistance still at 6600, with OI of 57.55 lacs. 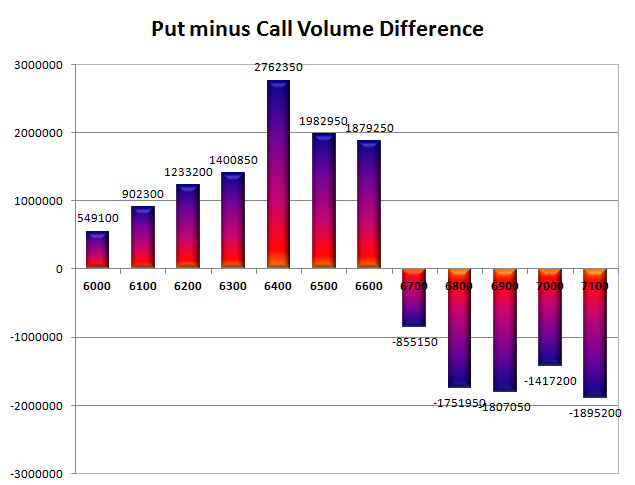 Day Nifty Spot Range as per Option Table is 6521 - 6614 and as per VIX is 6527 - 6640 with 6562 as the Pivot. Nifty opened positive around 6515 but was unable to sustain the highs and was sold off to the lows of the day around 6485. The index stayed within a narrow for the rest of the session and closed just up at 6493.20, a small gain of 10.10 points. The broader market was strong, with 875 advances to 597 declines. Best support for the series at 6400 and resistance at 6600. 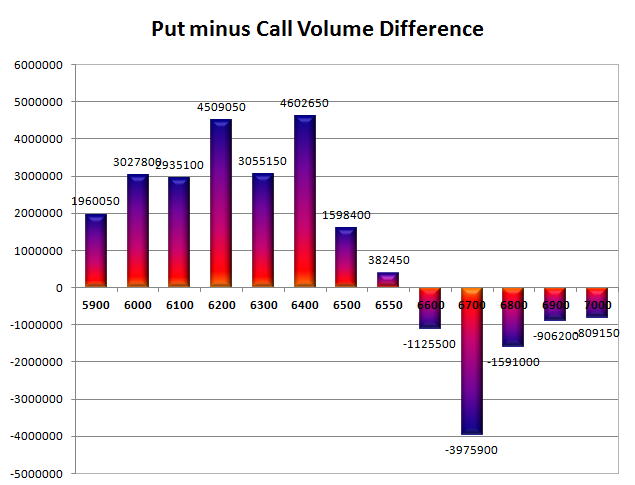 Call option 6500-6600 added 9.42 lacs huge amount of OI with profit booking seen at 6700 and above strike prices. 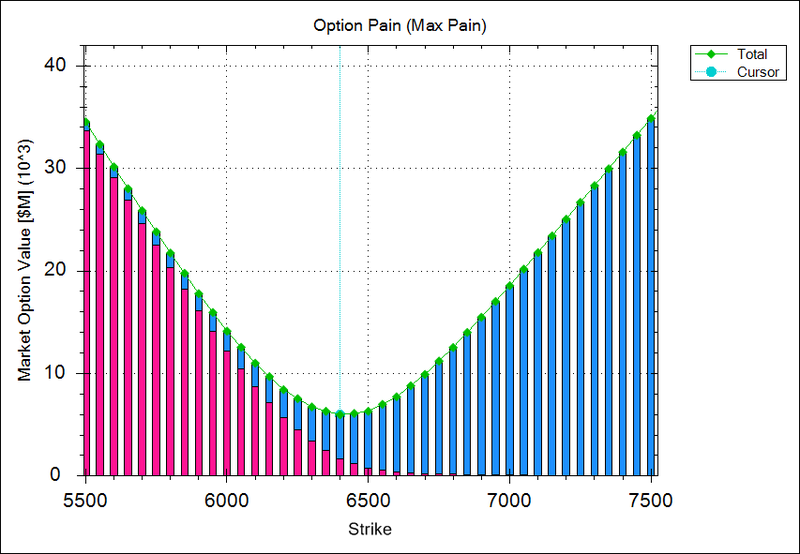 Put option 6400, 6200-6100 added 2.25 lacs huge amount of OI with huge short covering seen at 6500 and above strike prices. Nifty Open Interest is at 2,01,48,650 up by 8,59,550, whereas April Series also added 4.17 lacs with no change in price, most probably huge long/short build in both series. Bank Nifty Open Interest is at 16,79,750 down by 74,275, whereas April Series added just 0.24 lacs with increase in price, most probably small rollover with short covering. FII’s sold huge 12.42 lacs Futures, mostly short build-up, as their net OI increased by 45188 contracts (includes 68969 longs to 93817 shorts for the day) and the average price per contract comes to around 6475.81. FII’s future open contract as on date is 555709. PCR Open Interest (Volume) has moved down again to 1.238. Initial and best support at 6400, with highest OI of 67.08 lacs. 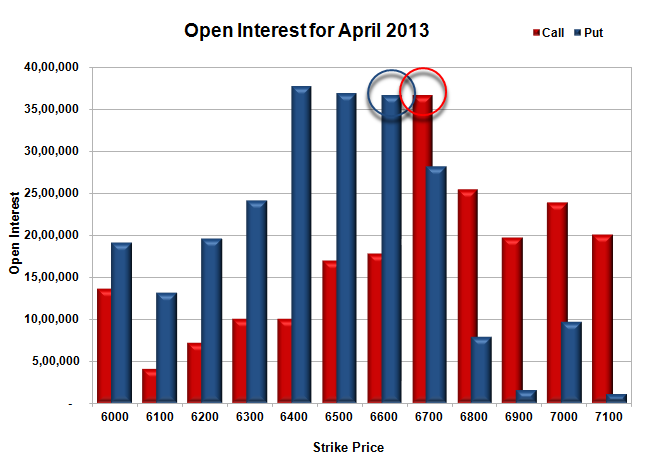 Initial and best resistance at 6600, with OI of 66.00 lacs. 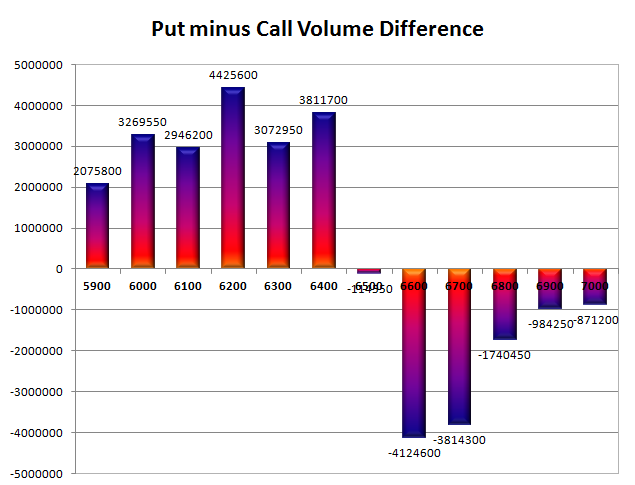 Day Range as per Option Table is 6451 - 6546 and as per VIX is 6438 - 6548 with 6501 as the Pivot. Nifty opened strong and went on test the highs of the day within the first hour of trade. Profit booking from higher levels saw the index losing all gains and closing at 6516.65, a small gain of 12.45 points. The broader market was strong, with 854 advances to 626 declines. Best support for the series still at 6400. 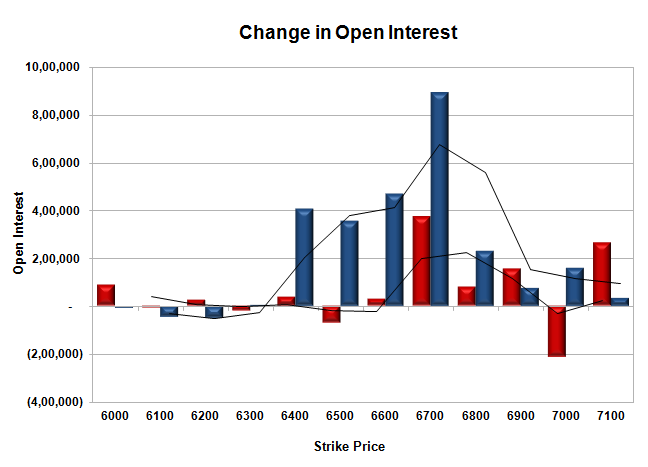 Call option 6600-6700 added 11.44 lacs huge amount of OI with short covering seen at 6400 and lower strike prices. Put option 6700-6500 added 5.63 lacs huge amount of OI with profit booking seen at 6200 and lower strike prices. Nifty Open Interest is at 1,96,60,100 up by 2,85,700, with small increase in price, most probably long build-up. 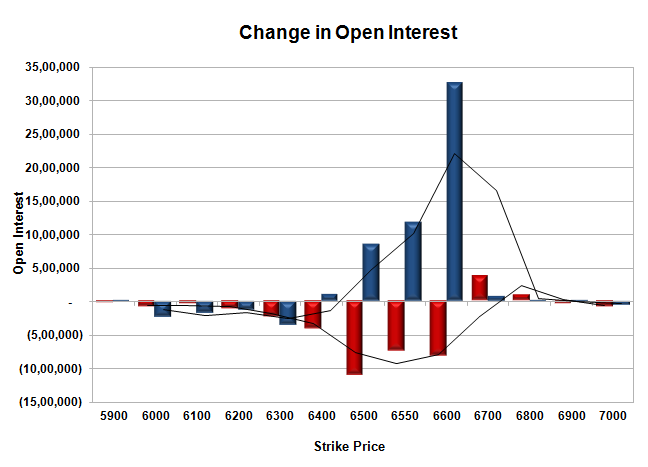 Bank Nifty Open Interest is at 18,68,775 down by 49,050, with increase in price, most probably short covering. FII’s bought huge 6.36 lacs Futures, mostly short covering, as their net OI decreased by 428 contracts (includes 64759 longs to 52041 shorts for the day) and the average price per contract comes to around 6500.77. FII’s future open contract as on date is 494623. PCR Open Interest (Volume) has moved down to 1.368. 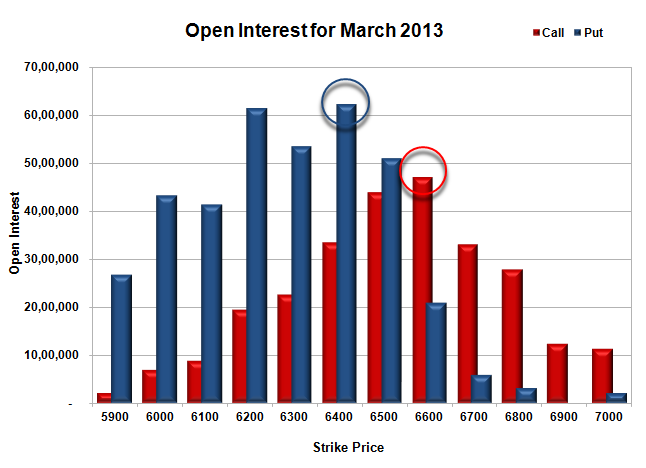 Initial support at 6500, with huge OI of 54.18 lacs and below that at 6400 with highest OI of 62.24 lacs. 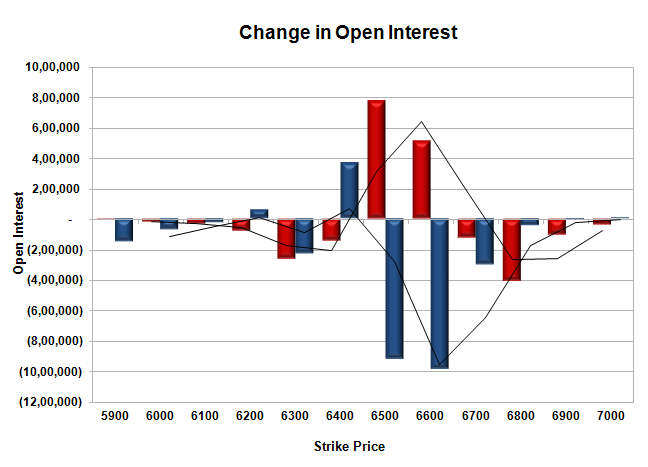 Initial and best Resistance at 6600, with OI of 51.87 lacs. 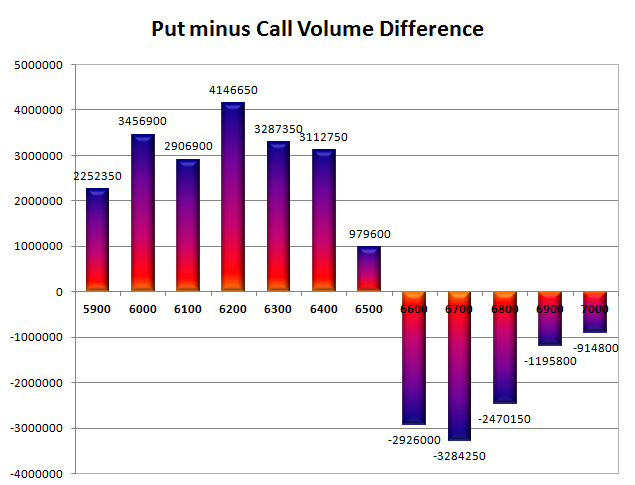 Day Range as per Option Table is 6471 - 6581 and as per VIX is 6458 - 6575 with 6530 as the Pivot. Nifty opened weak on the back of bad global cues and went on to touch the lows of 6430, but saw responsive buyer coming back in the afternoon session to move the index in green above the psychological level of 6500 at 6504.20, a small gain of 11.10 points. On a week on week basis the Index lost 22.45 points or around 0.34%. The broader market though was weak, with 596 advances to 881 declines. Best support for the series still at 6400. 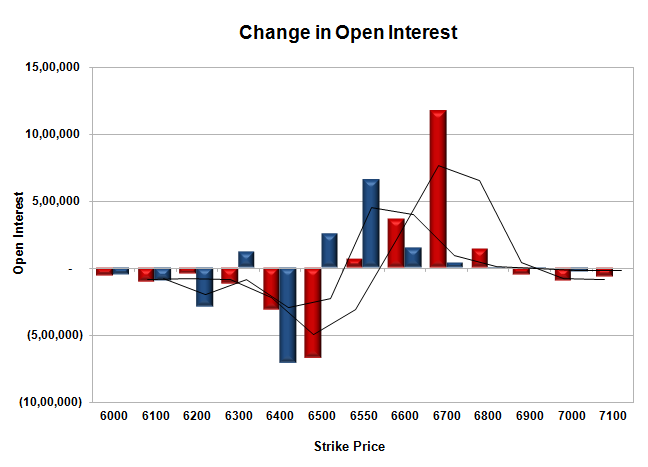 Call option 6600-6700 added 1.37 lacs huge amount of OI with short covering seen at 6400 and lower strike prices. Put option 6600 added 2.27 lacs huge amount of OI with profit booking seen at 6500 and lower strike prices. 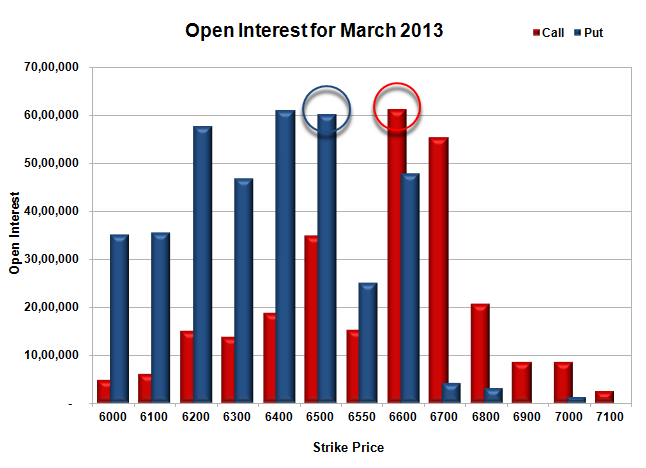 Nifty Open Interest is at 1,93,74,400 down by 37,100, with increase in price, most probably short covering. Bank Nifty Open Interest is at 19,17,825 down by huge 2,07,075, with decrease in price, most probably huge long liquidation. FII’s sold huge 10.63 lacs Futures, mostly short build-up, as their net OI increased by 7256 contracts (includes 51798 longs to 73050 shorts for the day) and the average price per contract comes to around 6488.28. FII’s future open contract as on date is 495051. 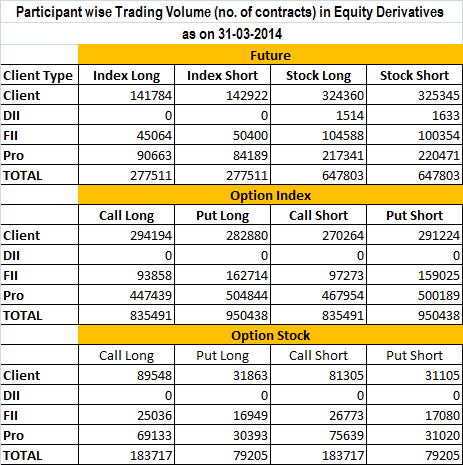 PCR Open Interest (Volume) is stationery around 1.426. 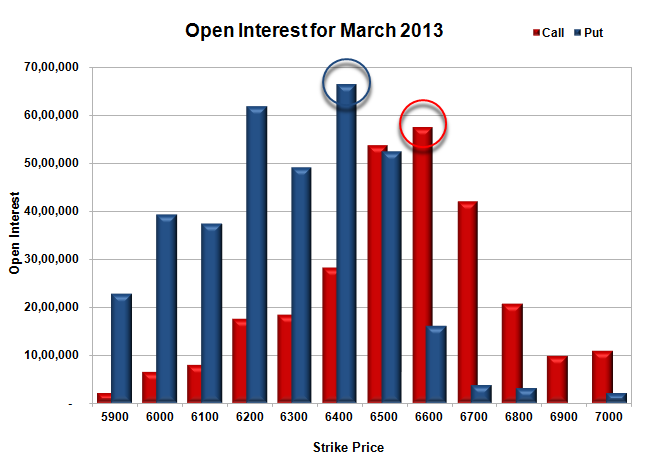 Initial support still at 6500, with huge OI of 50.93 lacs and below that at 6400 with highest OI of 62.32 lacs. 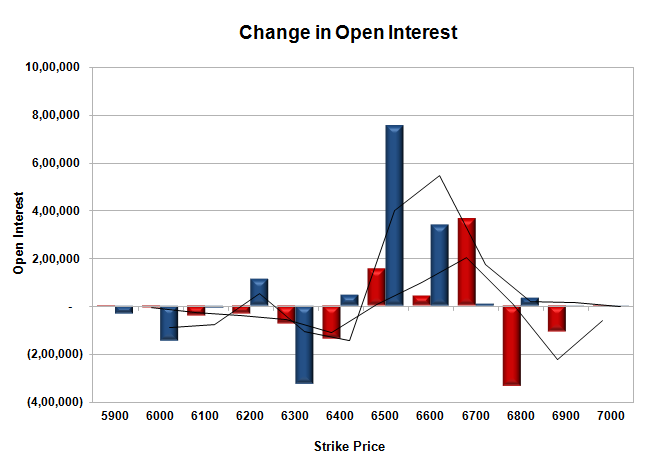 Initial and best Resistance still at 6600, with OI of 47.05 lacs. 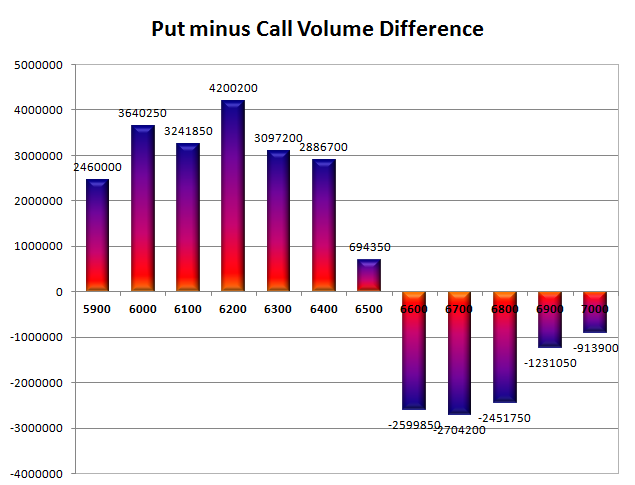 Day Range as per Option Table is 6434 - 6544 and as per VIX is 6448 - 6560 with 6485 as the Pivot.